We are an Anglican church within the Diocese of Guildford. We seek to be welcoming to all who come through our doors – welcoming to all those whom we meet in our every day lives. Our services are relaxed, often informal, joyful occasions, very open to families and children. Each week, during our 10:45 service, we have something for children – activities for them either in our church hall or in church itself. We seek to involve everyone in what we do – so we look forward to welcoming you to St. Stephen’s. 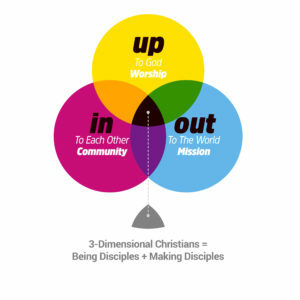 Our purpose can be summarised as being a church and people that seek to grow deeper in 3-dimensions: UP (Loving and worshipping God); IN (Loving and serving our church family) & OUT (Loving and serving our neighbour; Witnessing; Seeking Justice; Caring for creation). This 3-fold purpose is underpinned by our values: (i) Centred around Jesus; (ii) Building right relationships; (iii) Being welcoming and open to all; (iv) Encouraging all member ministry; (v) Open to the work of the Holy Spirit; (vi) Being generous and (vii) Compassionate. The parish of St Stephen’s, Shottermill is approximately triangular in shape – stretching from Weyhill to the Hindhead traffic lights. The church building is very much to one end of the parish and the council register indicates that there are about 5,000 people living within the parish boundary. There are a number of shops and businesses, as well as Woolmer Hill School and the Shottermill Infant and Junior Schools. Most of the parish is residential. The Church of England is the state church of this country, with the Queen as our head. There have been very close links between church and state, which have sometimes caused problems, but also provide the church with wonderful opportunities. Everyone has a right to be part of the Church of England, no matter what your background. The Church is now rather more clear on what it believes and what it expects of those who are its members. There are 44 Dioceses throughout this country, and parishes cover the whole land. The church has a wonderful heritage of worship and buildings – it now must seek to make itself relevant to the 21st century. We are seeking to do this through new services, new ways of involvement and new uses for our buildings. We are very fortunate in this area as the churches here work very well together. Over the years, we have carried out a number of very significant and worthwhile joint projects, and we are continuing to look for ways to work together. The main churches in Haslemere are St. Bartholomew’s and St. Christopher’s in the town, the Methodist church (our nearest neighbours), the independent Three Counties Church, and the Roman Catholic church Our Lady of Lourdes.